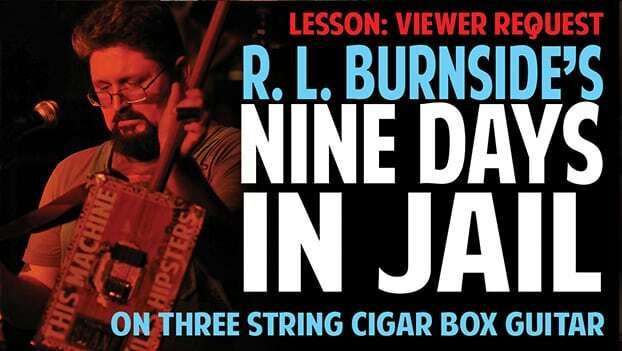 CIGAR BOX GUITAR VIDEO LESSON: R. L. Burnside's "Nine Days In Jail" | The How-To Repository for the Cigar Box Guitar Movement! TUNING: C MINOR (IMPLIED) – A variation of the Open G tuning (GDG). To get this tuning, simply take an Open G cigar box guitar and raise the middle string to Eb. The song, “Nine Days in Jail” is from R. L. Burnside’s album, My Black Name A-Ringin’. For reference, we present the original song. R. L. played the original version in the key of C#minor…or somewhere near that. (He probably didn’t use a tuner.) Shane Speal arranges the song for Cminor using a new tuning that is very similar to Open G: G Eb G.
Next Next post: New Country Gospel Tab – Wings of a Dove – as performed by Ferlin Husky, Dolly Parton, George Jones & More!